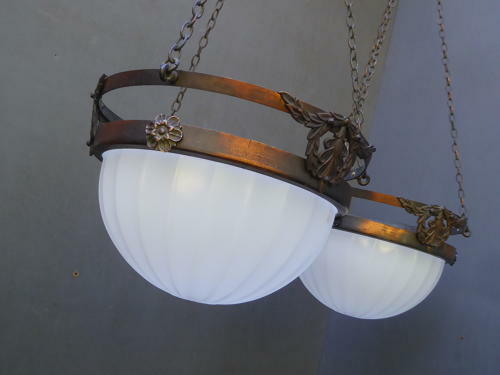 A stunning near pair original antique Jefferson Moonstone glass plafonnier lights. A beautiful & rare surviving pair with fluted opaque glass shades & the most amazing original copper galleries & embellished with subtle floral decoration. Both lights come with their original hanging chains & three-way suspension hooks, they are the same size & the shades are identical, the only subtle difference being the smaller floral decorations to the galleries. Jefferson pendant lights are noted for their robust nature yet wonderful delicate appearance & the opaque pressed glass shades emit a beautiful, unrivalled glow once lit. Supplied ready to install with a generous length of twisted flex & a brass bulb holder. Wear commensurate with age, the lights display beautifully & look amazing once lit. One shade has three chips around the top rim, all of which are hidden from view by the gallery once the light is assembled & one gallery has one non original fixing bolt inside one which can't be seen. UK courier service available at £15 per light tracked & signed for 24 hour delivery (Will be shipped separately to ensure they arrive damage free).